The best show I never watched. Until it was cancelled. There’s a few shows people have always told me I should watch, but I never seem to listen. I mean, I’ll get to them eventually, but I already have too much to keep track of on the ol’ TiVo as it is! Because of Netflix, I’m caught up on a show I’ve been told for a long, long time I’d love but never seemed to get around to watching. And whaddya know? My friends were right! I’m not the only one who suggests TV shows to people that gets them addicted. So what show am I talking about? 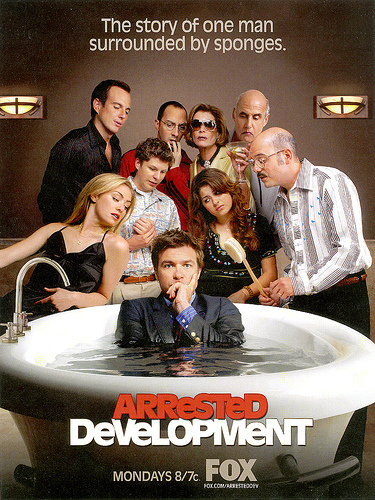 ARRESTED DEVELOPMENT. How cool am I, right? Yeah…don’t answer that. But seriously. Besides Modern Family, it’s the only show I’ve ever watched (OK and besides America’s Funniest Home Videos, too) that keeps me CONSTANTLY laughing the whole episode. I don’t care if you laughed or not, because I’ve watched it three times in the past 20 minutes and almost cried every time. Just watch the show. I knew that you would absolutely LOVE this show. I believe Buster is one of the funniest characters ever created. Plus Will Arnett as Gob is fantastic. I love them all. I can not wait for the movie!!! !